American President, Donald Trump has sacked the Director of the Federal Bureau of Investigation (FBI), James Comey. In a letter to Comey, Trump said the intelligence chief was “not able to effectively lead”. 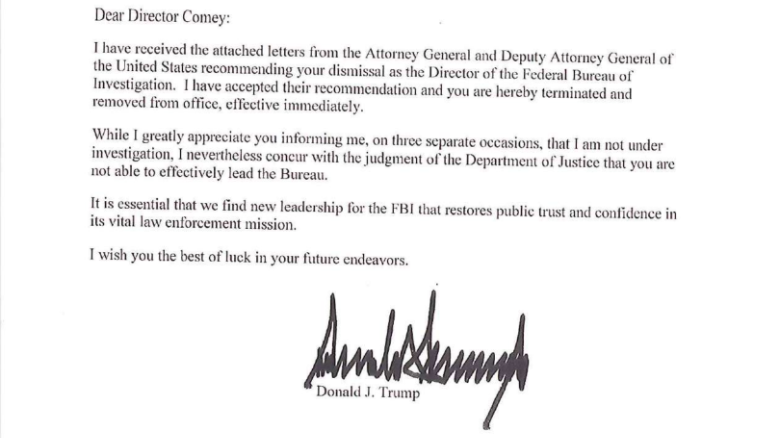 “The president has accepted the recommendation of the attorney general and the deputy attorney general regarding the dismissal of the director of the Federal Bureau of Investigation. “The FBI is one of our nation’s most cherished and respected institutions and today will mark a new beginning for our crown jewel of law enforcement,” Sean Spicer, the White House spokesman, said in a statement. Spicer also added that the search for a new permanent FBI Director had begun. James Comey was said to have received the news with shock.